DO YOU NEED HELP WITH COMMERCIAL ROOFING? WHY CHOOSE EPDM FOR YOUR COMMERCIAL ROOF REPLACEMENT? A synthetic rubber roofing system, EPDM roofing, EPDM—Ethylene Propylene Diene Terpolymer—is most commonly used for low slope, single ply roofing applications. It comes in a variety of thicknesses and can be applied using fully adhered or mechanically attached techniques. This rubber membrane or rolled rubber roofing is made of a mixture of recycled tires, sawdust, and slate dust and is one of the least expensive types of roofing on the market. There are pros and cons to any roofing decision and while EPDM is popular because of its cost, it’s also a common choice for commercial buildings because it lends itself especially well to low-slope roofs. It’s also trusted because it’s been around since the 1960s and has been revised to improve seam adhesion. 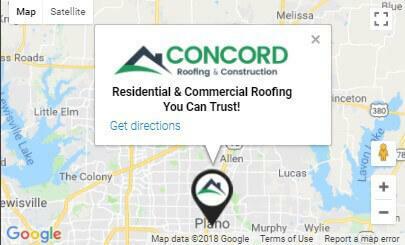 Concord Roofing & Construction is recognized as one of the top commercial roofing repair and replacement contractors in Texas. We provide a best-in-class customer service experience that includes superior materials and expert installation at a competitive price. One of the main reasons commercial building owners choose EPDM roofing over other types of flat or low slope roofing materials is its attractive cost. But there are other advantages to consider, and some disadvantages as well. Strength – Strong enough to support solar cells and rooftop gardens yet lightweight enough to adapt to any shape or style of roof. Flexibility – Although more common on commercial structures, EPDM is also popular with homeowners, especially for sheds and carports. Installation – EPDM is faster, easier and can be installed using adhesive and fasteners or ballasted with stone. Lightweight – The lighter weight means the roof deck doesn’t need any kind of additional reinforcement. Durable – EPDM roofs have fewer seams, which can translate into fewer leaks. The material doesn’t scratch or scuff easily, and can be repaired fast if a leak does occur. A quality EPDM roof can last up to 20 years and although it does absorb heat, it isn’t easily damaged by UV rays. Aesthetics – EPDM resembles a stretched out inner tube and the material can distract from a building’s curb appeal. Energy – The black easily absorbs heat and can lead to superheating of the structure below, leading to increased cooling costs. Strength – Although easily repaired, falling branches or aggressive hail can cause punctures in EPDM roofing. No contractor has more experience in Texas installing commercial EPDM roofing systems than Concord Roofing & Construction. We provide quality commercial roof installations to satisfy all your roof repair and replacement needs. All roofing systems we install are guaranteed by the manufacturer for material performance and we are in compliance with strict installation standards. Concord Roofing & Construction is your roofer of choice for commercial roof replacement services. We understand the complexities of providing the absolute best in commercial roofing installations, while ensuring minimal impact on your daily operations. Call us today to schedule an appointment at 214-978-6423. Our Commercial Roof Experts are available 24/7.